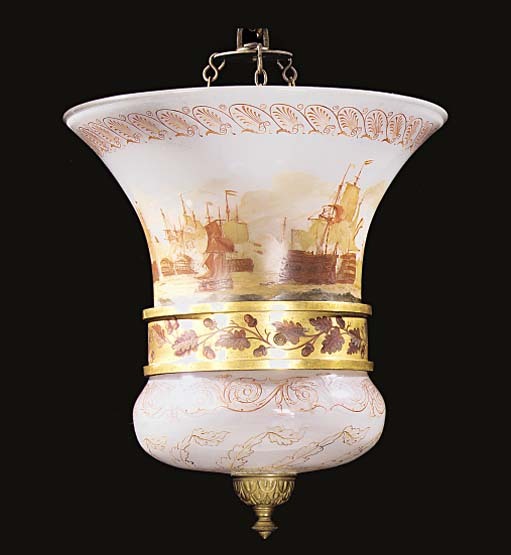 The Grecian lamp relates to the celebrated enamelled vase centrepiece that commemorates 'The Apotheosis of Nelson at the Battle of Trafalgar', executed in 1805 by the glass-enameller and light-manufacturer William Collins (d. c. 1860) for display at his Strand showrooms before being purchased by John Fish (d.1813) of Kempton Park, Middlesex. It is now on loan to the Brighton Pavilion (R. Edwards, The Shorter Dictionary of English Furniture, London, rev. ed., 1967, p. 461, fig. 61 and J. Gleeson, 'John Fish and the Dolphin furniture at Brighton Pavillion', Apollo, September 1997, pp.9-13). The lamp is of 'krater' urn form, while its rim is enriched with an Etruscan/Grecian palm-flowered border, derived from a vase from the collection of Sir William Hamilton (D'Hancarville, Catalogue of Etruscan, Greek and Roman Antiquities, 1766-7). The same border features on one of William Collins's signed enamelled lamps bearing the date 1814 and decorated with a hunting scene (sold by E. Medlicott, Esq., Sacombe Park, Christie's house sale, 11 October 1993, lot 138). The Sacombe lantern is the earliest recorded work of the light-manufacturer William Collins of 227, The Strand (fl. 1808-1852) who is best known for his work at Northumberland House for the Duke of Northumberland, a commission which spanned seventeen years. Among the self-descriptions used on papers in the Northumberland archive is one used in 1822: 'Glass Enameller Glass Manufacturer to the King and to the Royal Family' which presumably refers to the technique used here.